Organic compared with conventional soybean yielded similarly, despite not filling in between the rows until the first week of August, which contributed to in part to greater weed densities at harvest (photo taken on July 27). We initiated a 3-year study at the Aurora Research Farm in 2015 to compare different sequences of a corn, soybean, and wheat/red clover rotation in conventional and organic cropping systems under recommended and high input management during the 3-year transition period (2015-2017) from conventional to an organic cropping system. We provided detailed discussions of the experiment (http://blogs.cornell.edu/whatscroppingup/2015/11/09/corn-yield-under-conventional-and-organic-cropping-systems-with-recommended-and-high-inputs-during-the-transition-year-to-organic/) and the timing of 2016 management practices and weather conditions through July of 2016 (http://blogs.cornell.edu/whatscroppingup/2016/07/28/emergence-plant-densities-v2-stage-and-weed-densities-r3-stage-of-soybean-in-conventional-and-organic-cropping-systems-in-2016/). Briefly, corn was the preceding crop in 2015 and we moldboard plowed (May 19) and culti-mulched the experimental sites. We planted (May 20) the treated (insecticide/fungicide) GMO variety, P22T41R2 with the RR2Y and SCN traits, in 15-inch row spacing and the non-treated, non-GMO variety, 92Y21, in 30-inch row spacing at two seeding rates, ~150,000 (recommended input) and ~200,000 seeds/acre (high input). We treated the non-GMO, 92Y21, in the seed hopper with the organic seed treatment, Sabrex, in the high input treatment. We applied Roundup at 32 oz. /acre for weed control in conventional soybean at the V4 stage (June 22) in both recommended and high input treatments. We used the tine weeder to control weeds in the row in both recommended and high input organic treatments at the V1-V2 stage (June 9). We then cultivated close to the soybean row in both recommended and high input organic treatments at the V3 stage (June 15), followed by repeated cultivations between the entire row at the V4 (June 22), beginning flowering (R1) (July 1), and full flowering (R2) stages (July 14). The high input soybean treatment in the conventional cropping system also received a fungicide application on July 27, the R3 stage. We harvested all treatments on November 9 when conventional and organic soybean averaged ~12.0% moisture. We estimated soybean plant densities at the V2-V3 stage (June 13), prior to the close cultivation to the soybean row on June 15, but unfortunately after tine weeding the organic soybeans. Conventional soybean consistently had higher plant establishment rates (83 to 92%) compared with organic soybean (71 to 82%, Table 1). The lower plant establishment rates in organic soybean were probably associated in part with some crop damage during tine weeding. Nevertheless, plant densities exceeded 114,000 plants/acre in all organic treatments, the threshold density below which soybean yields decrease in NY under typical growing conditions (http://scs.cals.cornell.edu/sites/scs.cals.cornell.edu/files/shared/documents/wcu/WCU21-2.pdf). We are in the process of estimating soybean densities (and yield components) at harvest to determine the extent of crop damage during the subsequent four cultivations in the organic cropping system. Weed densities were exceedingly low in soybean through July or the R3 stage in 2016 (Table 1) probably because of the lack of significant precipitation events in June (0.74 inches) and July (1.89 inches). Weed densities were not significantly different between organic (~0.50 to 1.00 weeds/m2) and conventional cropping systems (~0.20 to 0.55 weeds/m2). In August, however, the experimental site received 4.56 inches of precipitation, which contributed to a significant increase in weed densities in both cropping systems, especially the organic cropping system. The exceedingly dry conditions (3.28 inches from the May 20 planting date through July 31) limited soybean vegetative growth, especially in organic soybean in 30-inch row spacing, which did not canopy in until early August. In contrast, the 15-inch conventional soybean canopied in by mid-July to provide some shade and perhaps reduce weed emergence after the Roundup application on June 22. 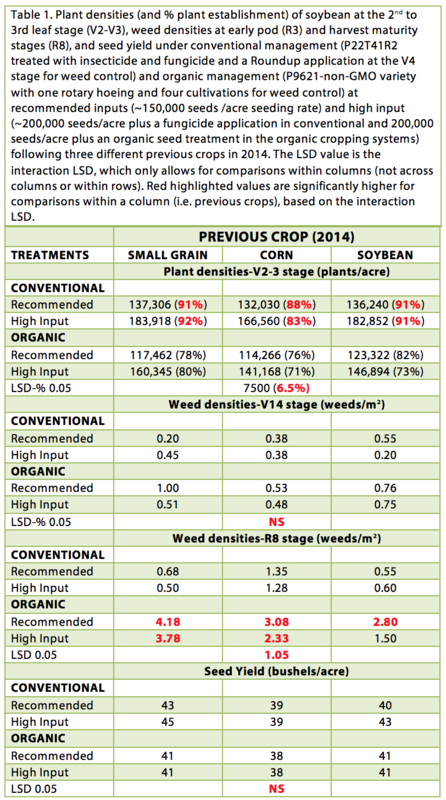 Consequently, the later shading in between the rows in organic soybean probably contributed in part to greater weed emergence after the last cultivation on July 14 and subsequent greater weed densities at the R8 stage (~3.0 weeds/m2) compared with conventional soybean (~0.80 weeds/m2, Table 1). In addition, the preceding organic corn in 2015 averaged about 2.25 weeds/m2 compared with ~0.55 weeds/m2 in conventional corn at the V10 stage in 2015 (http://blogs.cornell.edu/whatscroppingup/2015/11/09/corn-yield-under-conventional-and-organic-cropping-systems-with-recommended-and-high-inputs-during-the-transition-year-to-organic/), which may have contributed to a greater weed seed bank in the organic soybean plots. Despite lower plant densities and greater weed emergence from the R3 to R8 stage, organic soybean yielded similarly compared to conventional soybean (Table 1). Obviously, lower plant densities and greater weed emergence after the R3 stage did not affect organic soybean yields in a growing season when the least amount of rainfall was ever recorded at the experimental site from May 20-July 31 (3.28 inches), but adequate precipitation occurred from the R3 to R7 stage (physiological maturity). Likewise, in 2015, when the 2nd wettest June (8.00 inches of precipitation; only 1972 was wetter when Hurricane Agnes flooded NY and June totaled 11.57 inches), but the driest 8/1-9/9 period (R3 to R7 stage when only 1.36 inches was received) ever were observed at the experimental site, organic and conventional soybean also yielded similarly (http://blogs.cornell.edu/whatscroppingup/2015/11/09/soybean-yield-under-conventional-and-organic-cropping-systems-with-recommended-and-high-inputs-during-the-transition-year-to-organic/). It will be interesting to see if organic and conventional soybean will yield similarly in a growing season with normal precipitation patterns, if indeed a normal precipitation pattern ever does occur again! Organic soybean did not respond to high inputs (organic seed treatment and high plant populations), similar to results in 2015. The organic seed treatment did not improve soybean emergence, and plant densities were not significantly correlated with yield in 2016 (Table 2). Soybean has tremendous compensation ability, via development of numerous side branches with numerous pods, which allows yields to be maintained despite plant establishment rates of only ~70%. Consequently, conventional soybean usually does not respond to high plant populations (>150,000 seeds/acre) in NY as long as early plant establishment rates are ~114,000 plants/acre. Weed control, however is usually not an issue in conventional soybean (narrow rows and residual and/or post-emergence herbicides for weed control) when plant densities are low. In contrast, organic soybean relies in part on shading for weed control in the row so organic soybean has responded to high plant densities in some locations, especially in more southern latitudes than NY, because of improved weed control. Plant densities did have a negative correlation with weed densities at the R3 and R8 stages (r=-0.33 and -0.37, respectively, Table 2), indicating significant negative associations between weed and plant densities. Seed yield, however, was not correlated with weed densities at the R3 nor at the R8 stages (Table 2), which is noteworthy in a dry growing season, when weeds compete with the crop for scarce soil water. As the weed seed bank increases in the organic cropping system, it will be interesting to observe if weed densities (and plant densities) continue to have no association with soybean yield. Unlike 2015, conventional soybean did not respond to high inputs in 2016, probably because dry conditions limited disease development, resulting in no response to the fungicide application at high plant densities. 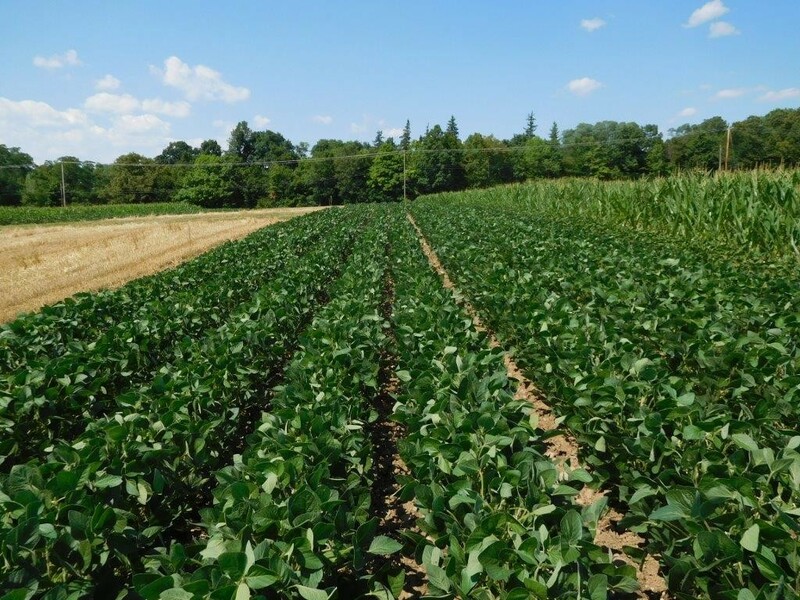 In conclusion, organic compared with conventional soybean yielded essentially the same during the second year of the transition from conventional to an organic cropping system, similar to yield data in 2015. As in 2015, organic soybean yielded the same under recommended input management, despite early plant establishment rates of only ~115,000-120,000 plants/acre. Based on the results of this study, soybean under recommended management practices appears to be an excellent crop for either the first or second year of the transition. Green stem, however, in the non-GMO organic variety prevented the harvest of soybean in late September when the seeds and pods of both varieties were ready for harvest. The ensuing wettest October on record at the experimental site (7.92 inches of precipitation), followed by another 1.10 inches of rain during the first week of November, further delayed harvest until November 9. Because of the wet soil conditions, we would not have been able to plant wheat after soybean until mid-November, which we deemed as too late in New York. The downside of an organic corn-soybean-wheat rotation is that delayed soybean harvest associated with late planting and/or a cool year or green stem (no registered organic desiccant for soybean) may prevent winter wheat planting and subsequent frost seeding of red clover (N source for organic corn in this rotation) in some years.